2018 was an exciting year for RTA. As we move forward into the new year, let’s take a moment to go over a few of last year’s highlights. The biggest event of 2018 was our management changes. The President of our Board of Trustees resigned, and Dennis Clough, Mayor of Westlake was voted in as new President. Also, our CEO, Joe Calabrese stepped down and Dr. Floun’say Caver was made interim CEO/General Manager. We look forward to working with the board to locate a new permanent General Manager. The HealthLine has been operating up and down Euclid Avenue for 10 years now. We celebrated the anniversary in November. In that month, we also celebrated the 50th year of our Red Line providing direct service to Cleveland Hopkins Airport! We had other milestones along the rails. In 2018 we finished construction on the East 34th Street Rapid Station, which is now named the Tri-C - Campus District Station. We also broke ground on three other rail stations; East 105th - Quincy, East 116th - St. Luke’s, and Farnsleigh. Construction began this year on the renovation of the Customer Service Center at Tower City. Please excuse our dust as you use the Tower City Station over the next few months. The revisions will make it easier for our staff to serve you better. We hope you had a good year in 2018, and we look forward to serving you next year. Monthly Passes (All) – Maximum purchase, one pass every 14 days. The maximum dollar value is $220 every 30 days. If you require a larger number of passes, please visit the Customer Service Center at Tower City, or place an order through the RTA website (rideRTA.com). Stacie Meneffe is a second-generation RTA Operator who is following in the footsteps—and the rail tracks—of her father. He was the one who encouraged Stacie to pursue a career with RTA, and he explained what a great opportunity it could be for her. Stacie, meanwhile, didn’t require much convincing. She applied for an operator’s position, and says that turned out to be the best decision she could have made. We’ve been happy to have Stacie with us for 12 years now. For the first half of her time here, she drove a bus in the Triskett District. And while being on the road is its own memorable experience, Stacie had always been interested in rail. 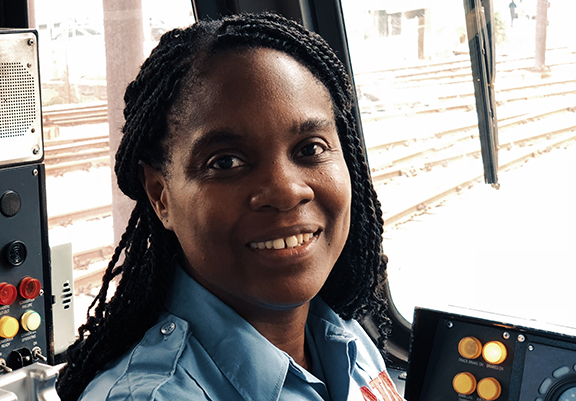 So when the opportunity to be a rail operator arose in 2012, she jumped at the chance to fulfill her dream. Stacie is now a regular operator on the Blue and Green Lines, and she enjoys the daily challenges and adventures. No matter what comes her way at work, Stacie always greets it with a smile. She advises future operators to take a page from her book—her advice to them is, “Don’t let fear stop you from applying. Try something new and different, and you’ll see it may be the best thing for you.” It’s certainly worked for Stacie: she’s maintained a reputation for being a friendly, safe, and reliable operator. And the regulars who make sure to wait for her train are bound to agree! Of course, we like you just the way you are. But if you’re set on having a New Year’s resolution, we suggest you try taking public transportation more often. You’ll save on gas money, car maintenance, and parking fees.You can squeeze in some extra steps walking to and from transit stops. You won’t have to deal with stressful stop-and-go traffic. You can use commuting time to read or enjoy other leisurely activities. You’ll cut down on emissions and consumption of natural resources. We hope to see you more throughout 2019! Baseball fans: the wait is almost over! While we still have some time to go before Opening Day, you can get your Indians fix by visiting Tribe Fest, the annual pre-season celebration that’s always a home run. This year’s event is taking place Sunday, January 20, at the Huntington Convention Center. The sixth annual celebration will include player events on the main stage, question-and-answer sessions with manager Terry Francona, and autograph sessions (which require additional tickets). It’s a great way to get to know the Tribe. The day will occur in two shifts. The first is 8:30 a.m. – 12:30 p.m., and it’s exclusive to season ticket holders. The second shift is 1:30 p.m. – 7:30 p.m., and it’s open to the general public. RTA has assembled a great line-up to get you there: simply ride any Rapid line to the Tower City Station. The Convention Center is a short walk from Public Square. Or, from 11 a.m. – 11 p.m., you can ride the free C-Line Trolley from the Tower City Station to St. Clair Avenue, which is near the Convention Center entrance. Have fun and go Indians! Cleveland’s favorite storytelling venue continues its tradition of excellence with two major shows. From January 15–20, you can enjoy Rodgers and Hammerstein’s Cinderella, and starting January 29, you can watch an acclaimed production of Miss Saigon. Construction has made parking more difficult, but your friends at RTA are helping to ensure the show goes on: simply take the HealthLine or C-Line Trolley. Both serve Playhouse Square and have conveniently located stops along the strip of theaters. Bravo! This month, you can catch Disney On Ice as they present “Mickey’s Search Party,” a special event that’s sure to provide fun for the whole family. As an exciting bonus, RTA riders receive an exclusive discount of $5 off every ticket when they use the promo code RIDE5. Friday, January 11: 7 p.m.
Saturday, January 12: 7 p.m.
Sunday, January 13: 5 p.m.
Thursday, January 17: 7 p.m.
Friday, January 18: 7 p.m.
Saturday, January 19: 7 p.m.
Sunday, January 20: 7 p.m.
You can redeem this code online when you buy tickets through The Q’s website (theQarena.com). Or you can mention it when ordering at The Q’s box office. On Monday, January 21, there are many free events throughout Cleveland celebrating the life and legacy of Dr. Martin Luther King Jr.
Tri-C’s 42nd Annual Dr. King Celebration is at Playhouse Square’s KeyBank State Theatre from 2:30 p.m. – 5 p.m. and will feature a performance by Grammy-winning artist Shirley Caesar. The HealthLine serves Playhouse Square, and buses run frequently. The Rock & Roll Hall of Fame is offering free admission from 10 a.m. – 5:30 p.m. so you can hear music influenced by the Civil Rights Movement and enjoy educational programs. To get there, take any Rapid line to the Tower City Station, transfer to the Waterfront Line, and exit at the North Coast-E. 9th Street station. The Museum of Contemporary Art offers free admission from 11 a.m. – 5 p.m. so you can contemplate art and its real-world connections. To visit, take the HealthLine to Cornell Road or take the Red Line to the Little Italy-University Circle stop. For more information, please visit the websites of these generous institutions. By now you should know that you can text 216-575-EYES to report suspicious activities in or around RTA facilities and vehicles. But what constitutes a suspicious activity? Luggage or belongings left unattended. Persons breaking into restricted areas. Persons tampering with RTA equipment. Please remember that factors such as race, ethnicity, and/or religious affiliation are not suspicious.